Miami Herald columnist Leonard Pitts Jr. makes a counterintuitive argument about a group of U.S. Marines captured on video urinating on the corpses of Taliban fighters. He say we should not be so quick to judge them because what seems appalling stateside may seem normal on the battlefield. Nearly 30 years ago Greg told me how it was, cutting the ears off dead men. I had sought out Vietnam veterans to interview for a story about a pop song that was inspired by the war — 19 by Paul Hardcastle. Greg gave me an earful. He explained how it is when the skin rots right off your foot. How it is when children are rigged to explode, so your first instinct is to shoot them when they come running up to you. How it is when the sight of an Asian face or the sound of a helicopter is enough to flash you from city streets to Vietnamese jungles. How it is living haunted days and nightmare nights, craving suicide, but lacking “the guts.” And, yes, how it is that guys used to collect the ears from dead enemy soldiers as souvenirs, sometimes stringing them together and wearing them like grisly necklaces. I think of Greg whenever it is time to pass judgment on the things soldiers do. As it happens, much of the nation is now passing judgment on something a group of Marines did. 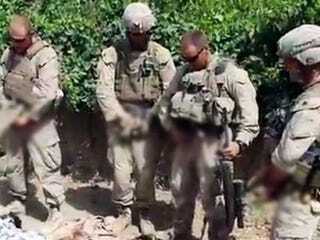 In a video that has sparked international outrage, four of them are seen apparently urinating on the corpses of Taliban fighters. The White House is embarrassed, there is speculation this will derail peace talks with the Taliban, and the four Marines are being both defended and reviled by the usual media and political figures.